We're now officially in Countdown mode. 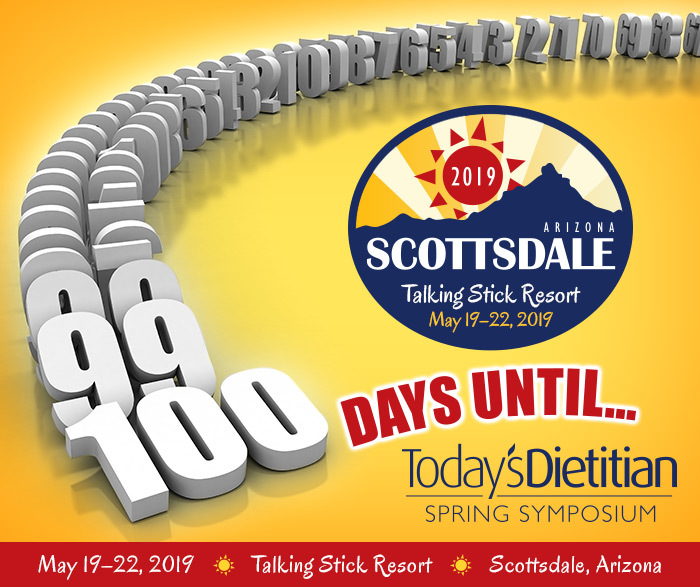 There are just 100 days until the 2019 Today's Dietitian Spring Symposium at Talking Stick Resort in Scottsdale, AZ. Register now to earn 15 or more CEUs in sessions led by some of the foremost experts in nutrition and dietetics. Our full session schedule is available here. In addition to the continuing education, we'll also have a variety of opportunities to interact and network with fellow RDs in attendance. Our high-energy exhibit hall is where sponsors will show their newest products and brands, providing samples and answering all questions. We’ll also have a number of special events, fitness classes, and even a ‘80’s throwback concert with The Radio Rebels, presented by Regular Girl. We invite you to expand your nutrition expertise and professional development by joining us in this picturesque location in the Valley of the Sun. For more information and to register, visit TodaysDietitian.com/SS19. Call 877-925-2355 or email symposium@gvpub.com if you have questions.